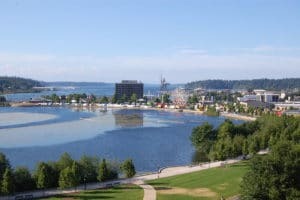 Located in the northeastern part of the state of Washington near downtown Seattle, Lake City encompasses the Cedar Park, Matthews Beach, Meadowbrook, Olympic Hills, and Victory Heights neighborhoods. From its humble beginnings in the 19th century to today, its population has become very diverse. It includes college-educated urban singles, retirement-age families with grown children, and multi-lingual urbanites of varying education levels. Lake City HistoryThe city has gone through many changes over the years, with many factors fueling its exponential growth over time. At first, it belonged to the Duwamish Indians, but in the 1850s white settlers took it over and turned it into a logging and farming community. In the 1870s, the Little Germany neighborhood grew out of a group of immigrant farmers. After President Grover Cleveland granted statehood to the state of Washington, the community expanded even further when the construction of the Seattle, Lake Shore and Eastern Railway enabled greater population growth and economic development. This part of the city got its name in 1906. The popularity of the automobile led to new growth and developments beyond the original farms and houses. During the years of the legal prohibition of alcohol, the city’s newly built roads made it a popular destination for bootleggers as well as a place where legitimate businesses could set up shop and attract a customer base. By 1935, the city had built both a library and a school — in the same building! While the opening of Northgate Mall in the Northgate district and the construction of I-5 affected businesses in the 1950s and 1960s, a 1970s renovation helped fuel the city’s economic recovery. Today, the city still has plenty of evidence of its German heritage left; there is still a German bakery in operation in addition to all sorts of other ethnic cuisines, including Greek, Persian, Chinese, Japanese, and Thai. There is even a Southern-style fried chicken joint! Even though trains and automobiles helped fuel the historical growth of the city, bikers and walkers still give it very high scores for its flat terrain, the presence of bike lanes, and the ability to accomplish most errands on foot. The Burke-Gilman Trail makes that easy as it also offers a glimpse at some of the natural beauty of the area along the lake. It is open to the public every day from 4:00 AM to 11:30 PM. The neighborhoods within the city all have something unique to offer. Matthews Beach is a popular seasonal destination for locals who like to go swimming and want an alternative to a commercial pool. It is a freshwater beach on land that used to belong to John G. Matthews all the way back in the 1880s. Meadowbrook is where a lot of the residential neighborhoods are located, along with some of the most beautiful fall foliage. Cedar Park is the site of a playground where you can take your children and have fun. The Albert Davis Park is located in the Olympic Hills neighborhood, which is also the location of a public golf course and a polo field. According to the United States Census, it covers the zip codes 98115 and 98125, but despite its name, the government counts it as just one part of the overall city of Seattle, not a separate city. As of January 2018, buying a new house here can cost anywhere from $450,000 to as much as $2,350,000. A condominium or a townhouse will usually cost less than that; the average cost of one for sale is between $325,000 and $489,000. Since the easternmost side of the city is on Lake Washington, there is also waterfront property for sale and for rent, some of which is in close proximity to the Burke-Gilman Trail. There are even slots available for houseboats! As of 2016, the median cost of an owner-occupied housing unit is $484,600, which is much higher than the national average of $184,700. The median gross rent is $1,266 per month, higher than the national average of $949. While it may seem expensive compared to the overall American median, it is still one of the less expensive parts of Seattle. 54% of people in the Olympic Hills neighborhood alone own their own homes compared to 48% for the city of Seattle as a whole. Give us a call today to analyze the market comprehensively for your rental property. You will never be short of retro charm and old world culture when you are in the Lake City district of Seattle, Washington. Our property management team specializes in residential areas throughout Lake City, WA. We offer multiple services to take your rental property and convert it into reliable income. We have a thorough screening process that helps to identify the right tenants for your property. Our team works hard to keep both parties happy through effective communication, bullet proof lease agreements, and timely monthly rent collection. We offer maintenance services to enhance the property and ensure that it will retain or increase in value. We oversee everything, allowing you to sit back and relax and know that your property and your tenants are in good hands. Contact us today if you are ready to receive a comprehensive analysis of your rental property and to inquire about our Lake City area property management services.